My husband says that all the time. Clearly it is in a different context, but it still applies to what I am going to talk about. And what, you may ask, am I talking about? Rice, my friends, rice. We all know that brown rice is better for you than white rice. Brown rice is higher is manganese, selenium, natural oils, and fiber. It is a whole grain, an antioxidant, and a slow-release sugar. All of these things also mean that it actually can help PROMOTE weight loss for those of you that care about losing weight, and it can lower your overall cholesterol, something everyone should care about. "But it takes SOOO LONG to cook!" I can hear you whining. Stop whining. I can hear you. Cut it out. White rice is faster to cook because all the good stuff is stripped out. All the fiber, all the minerals, all the awesome whole grains...gone baby, gone. I am here to solve your problem about how long it takes to cook. If you quit whining, I will tell you. If you keep whining, I will take my shoe off and beat you. Okay, thank you. First of all, I know that it is a total pain to try to remember one hour before dinner that you want to have brown rice. Seriously, Uncle Ben's Minute Rice starts to look pretty awesome at 5:45 PM when your 3 kids are fussing and you just walked in the door and all you have is 8 chicken nuggets and nothing else. I get it. But with a teeny tiny bit of planning, you can have healthy brown rice in the same amount of time as Uncle Ben's. These are the supplies you will need: 1 32-oz bag of brown rice, 1-40 count box of quart size storage bags, salt, measuring cups, measuring spoons, a medium pot, water, a glass, a bottle of wine. 1. Pour a glass of wine. All of my instructions always start this way. Get used to it. 2. Find a time when you are already doing something else in the kitchen. Emptying the dishwasher, pretending to clean while really screwing around on Facebook, digging into your secret chocolate stash, whatever. 3. Find a good-sized pot and bring 7 cups of water to a rapid boil. 4. When boiling, add 3 cups of brown rice and 2 tsps of salt. Lower to a simmer and cover. 5. Let simmer for 45-50 minutes or until all liquid is absorbed. While this is happening, please go about your business.Call a girlfriend. Vacuum. Watch Glee. 6. 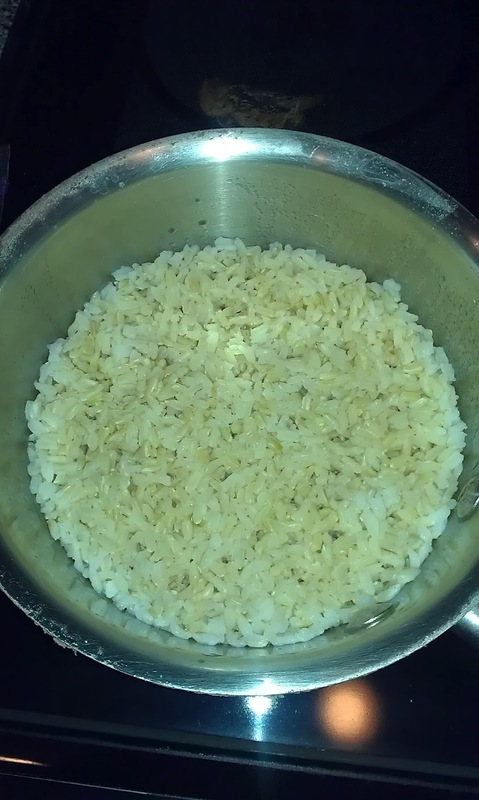 When the rice is finished, remove from heat and let it cool. You should have a LOT of rice. 7. 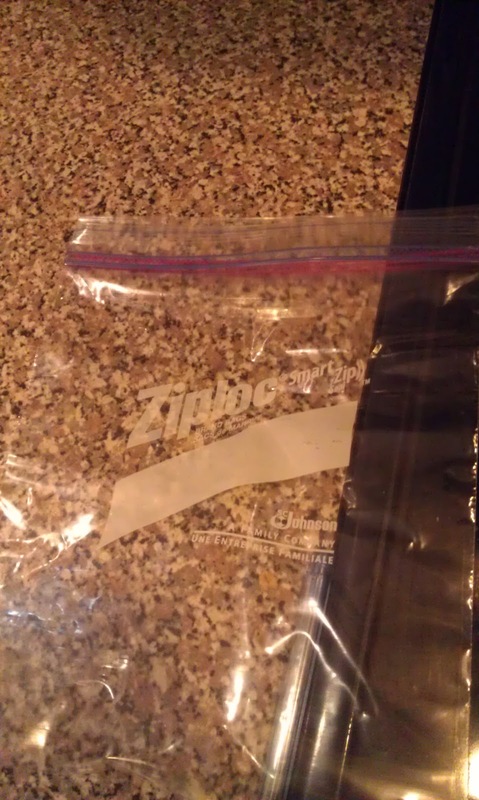 Now, get your quart storage bags and start scooping 2 cup servings into each bag. Press the air out so they lie flat and then seal them up. 9. 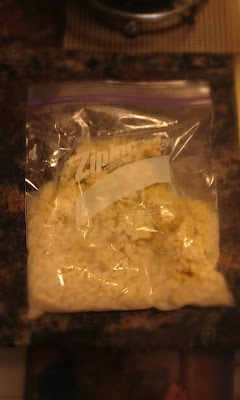 When you need to cook rice next time, open the bag about 2 inches, add a tablespoon of water and microwave for about 6-7 minutes or until thawed and fluffy. 10. Have another glass of wine to toast your awesome-ness. You should have about 5 2-cup bags of rice. You can always make more or less depending on the size of your family or how many servings you need. Cost-wise, this is amazingly cost-effective. A bag of ShopRite brand brown rice here in Jersey costs $1.39. It has 22 servings in it. You can buy Uncle Ben's Brown Rice boil in a bag for $4.59. It has 18 servings and costs 3 times as much. And those are "family size" bags, so you can't customize the amount of rice you put in each bag. Maybe you only want 1 cup in each storage bag. Maybe you want 3...if you do it yourself, you can choose. At E's Delights, we often provide these little freezer bags of frozen rice for our clients as a side with our chicken and beef dishes. It's a great way to work in a 1/2 cup of whole grain and a no-brainer when you come home fried at the end of a busy day. Seriously, you won't ever reach for the white rice again! Once you go brown, keep coming around- oh no you didn't! Love it- and yes- love me some rice!!!! It was just too easy...I couldn't resist. Hee hee. Great idea...we only eat brown rice here and I always forget to put it on in time and those bags from Trader Joes are great but get pricey...Great solution.